Thanks Jim. Part of my decision to contest the charge was being unsure if I could keep going through this without retraumatising myself. Jim kept at it and asked me if I felt like testifying. I felt I was and Jim gave me my own “day in court”. Thanks a lot mate. Last week Anne, Eleni and I drove 1800 kms to go to court in the chilly city of Geelong. 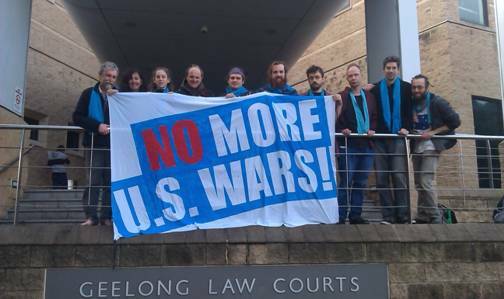 About 10 others came from Melbourne and Geelong to attend the final court case arising from last year’s Swan Island actions, and bear witness to the power of community and resistance. However it appears even with bags over their heads they managed to see more than the police officers on the scene!